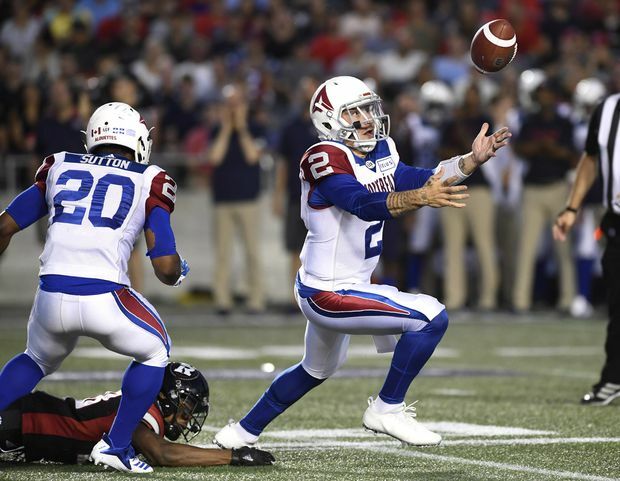 Montreal Alouettes quarterback Johnny Manziel loses control of the ball during the first half of a game in Ottawa on Aug. 11, 2018. Calvillo suffered a career-ending concussion in a 24-21 loss to the Saskatchewan Roughriders on Aug. 17, 2013. When he retired in January, 2014, Calvillo left as pro football’s all-time passing leader (79,816 yards) and was inducted into the Canadian Football Hall of Fame three years later. Smith, currently the leader of the opposition in the Senate, wasn’t afraid to roll up his sleeves while with Montreal. He made more than 200 appearances annually throughout Quebec promoting the Alouettes brand. There was also consistency on the Alouettes’ active roster with such players as Calvillo, slotback Ben Cahoon, offensive lineman Scott Flory and kicker Damon Duval. Montreal’s lineup also featured a number of francophone players such as running backs Éric Lapointe and Bruno Heppell, receiver Éric Deslauriers and safety Étienne Boulay, to name a few. But after averaging just more than 19,500 fans last season, the Alouettes are attracting 17,862 in 2018. Pipkin is expected to start Friday night when Montreal plays host to Toronto. Trestman left after the ‘12 season to become the head coach of the NFL’s Chicago Bears. Montreal has had six head coaches since, including Popp twice (2013, 2015-16). The others include: Dan Hawkins (2013); Tom Higgins (2014-15); Jacques Chapdelaine (2016-17); Kavis Reed (2017); and Mike Sherman (current). Montreal quarterbacks to start since Anthony Calvillo suffered a career-ending concussion in 2013 (number of games in brackets). 2018 — Drew Willy (4), Jeff Mathews (1), Vernon Adams Jr. (1), Johnny Manziel (2), Antonio Pipkin (1).